Cost varies depending on the size of the job, the amount of labor and materials necessary to complete. 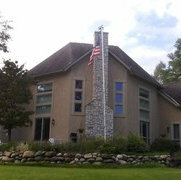 All employees are Certified Certainteed Master Shingler Applicators and Shingle Quality Specialists. We hired Hancock's Handyman Service to repair our roof leak around our Chimney, we have had a few others attempt the job but the fix was only temporary. Mike and his crew were not only timly and efficient, they were very courteous to us and considerate of our landscaping and home. They are highly recommend and we are very pleased with the completed work.